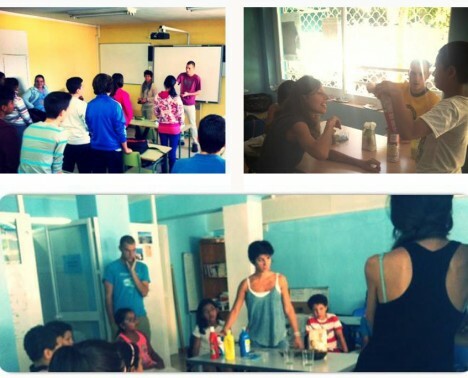 Hi, my name is Josh, I’m 24, I am just finishing a 10 month European Voluntary Service project in Sevilla, Spain. I chose this EVS (European Voluntary Service) project predominantly because it was working with young people, and for a long time I’d had an interest in Spanish culture and wanted to experience it first hand. In the UK, I worked as a Youth Worker, and hold a degree in Youth Work & Community Development. Therefore I was searching for voluntary positions within this sector. My organisation works with migrants with low-incomes who require support with various things; from immigration/resident application processes, employment opportunities, language support or, most relevant to my position within the organisation, educational support for children and young people (ranging from 6-16 years of age). In my position, I organised and participated in a program of curricular support classes, and informal education workshops. Within our regular weekly programme we had 3 days of curricular support sessions, a sports workshop, an English workshop, a creativity-based session for children and a youth work session for teenagers. Within the curricular support sessions, we supported children and young people with areas of their academic development in which they needed extra help; we worked with the local schools in determining these areas, and of course constantly assessing their progress. The sports workshop aimed to promote physical activities and sports, and as such we offered a different sport or physical activity each work. The main challenge was ensuring the participation of all: with a huge range of abilities and kids as young as 6 to teenagers of 15 years old in the same group, this could often require innovative ways of ensuring that everyone was involved in the activities. The English workshops used an informal education approach: we used games, sports activities, songs and theatre in our sessions. We were not and did pretend to be a school: besides, the kids had already had 8 hours of formal education each day, so we tried to use different methods to class-style learning. In the creativity-based session, for kids from 6-11, we used art, drama, music and other creative methods to run educative sessions around a huge range of themes: for example constructing planets from papier-mache, whilst also learning about their comparative sizes, colours, and characteristics, or writing and constructing a group story book. The youth work sessions were for young people aged from 12-16, and in these sessions we used roleplay, talks and debates, excursions and other methods to explore topics such as gender violence and democratic participation. We also visited exhibitions, events in the city, organised orienteering in a local park amongst other things. During the summer we had a daytime programme rather than our evening sessions, and as it was the school holidays, we didn’t run the curricular support sessions and instead ran more of the informal educational sessions. We also organised a 6 day summer camp in the countryside, with 42 kids and teenagers, we ran activities such as hikes, rafting, climbing, sports and outdoor games. The project and EVS experience in general has been an amazing experience, and one which has helped me develop both professionally and personally. My work with the children and young people has increased my experience, knowledge and capacity as a practitioner: from new activity ideas, working with groups with a huge range of ages and abilities, and communication without a fluent language ability. Personally, it has been fantastic as well: one of the great things is that you meet, and live with, people from different countries and cultures: in our lives in our home countries we often group around people of the same interests and social groups, and in EVS you meet, work and live with people that perhaps otherwise you wouldn’t have had the opportunity to meet. Arriving in a new country and not speaking the language was extremely difficult at first, but has also taught me a lot about how language can dictate how much autonomy and independence you have with self-expression, and how debilitating it can be to not have the linguistic tools at your disposal to express yourself how you would like. Since I arrived I was determined to not speak any English at all (not at work nor at home): although this meant a very difficult and frustrating 2-3 months, it meant I learnt quickly and am now proud that I can say I speak Spanish. The experience will change me in so many ways: I have learnt a lot about myself and about others through this experience, I have been inspired to explore the possibilities for working with Erasmus Plus within my profession in Leeds, and have a clearer idea of what I would like to do in the future. Holistically, it has changed my perspectives on certain things, and how I feel about what is possible and what can be achieved. European Voluntary Service (EVS) project supported by the Erasmus+ programme of the European Commission.